Add audio to your video and edit video with powerful editing tools. The audio or music of video can have a dramatic effect on our perception of a video – no matter whether it’s a home movie, a commercial, or a video presentation. But what if all you have is silent footage or with just crackled and distorted audio file that needs to be replaced and at this time, you really want to add a sound to video? To solve this problem, I humbly recommend Wondershare Filmora . With it, you can easily add audio to video, or replace the original audio track (stream) with a new audio file or voiceover. 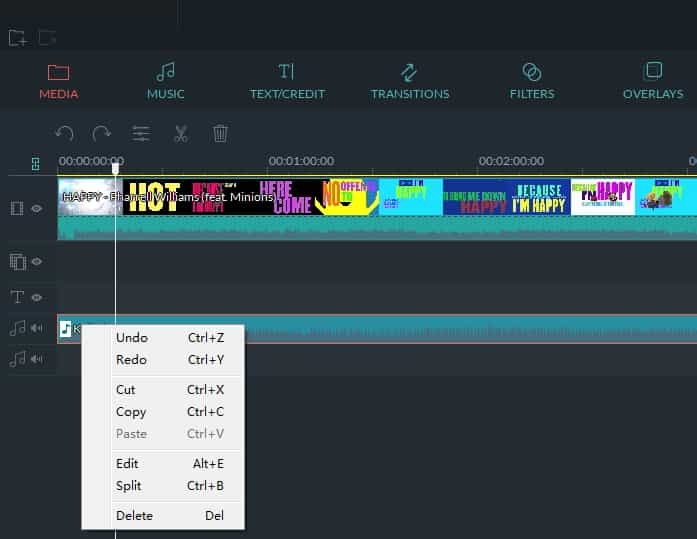 Now see the easy steps to add audio to video files or replace the original audio track. So, here, I will let you know how to add audio to a video. Supported OS: Windows (Windows 10 included) & Mac OS X (above 10.6). After downloaded and installed Wondershare Filmora, you can either click Import on the primary windows and select audio and video files from your computer, or simply drag and drop audio and video files to the User's Album. Drag the audio and video files from User's Album and place them on the respective tracks of the Timeline. This way, the audio file(s) will be merged into the video. Note that the original audio track will be kept. Instead of adding music to video, you can also add voiceover to video. It's a fun way to add narration or complementary audio to video. To do so, just click the Record button on the toolbar above Timeline, the Record dialog will appear. Click the red Record button and you can start to talk in 3 seconds. The voiceover will be added to User's Album as well as Timeline when completed. This is similar to add audio to video. Just an extra step is required: delete the video. To do so, right click the video you want to replace audio in it, and select Audio Detach. After that, delete the audio file from the track. As described above, you can then drag and drop a new audio file from User's Album to Audio track. A variety of audio editing tools are available: set volume, speed up, slow down, change pitch and add fade in/out effect. To change the settings, just double click the audio file on the timeline and drag the slide bar. Hit "Return" to confirm the settings and go back to the main interface. When all is ready, click "Create" and select "Format". From the list, choose any format you want as the output format. If necessary, also change the advanced settings. Finally, click "Create" button to export a new video file to the specified folder on computer. Besides export video your computer, you can also create video for devices like the iPhone, iPad, iPod, directly upload video to YouTube, or burn to DVD for playing on TV. All in one video editor, no extra software required. Above are the steps to add audio to video. If you want to know how to use another way to add audio to a video, you are welcome to leave a comment to us. Is it possible for me to uninstall/remove some effects (summer, valentine, etc) from my program? For some reason, ever since I downloaded and installed the Summer effects pack, my video and audio do not sync. My music track is longer (4:00) when played on top of video clips in Filmora. But it is 3:56 only when played with VLC, Windows Media Player, my mobile phone, and Filmora without video clips. Audio format? What formats can I upload into a movie project? As well as quality rate? Can I add my own narrative? Can I add my own art work ? When Im done can't i just save it to my computer and look at it and re edit it . Why do I have to go directly to "export". Why can't I just save. and upload when Im satisfied it's finished. This is very odd ending with "export". I'm having a horrible time trying to sync the audio. hi, which vesion are you using and can you please add a screenshot with this button?? THANKS!! I have added music from your gallery to a short video for my company- do I have to worry about copyrights or anything?